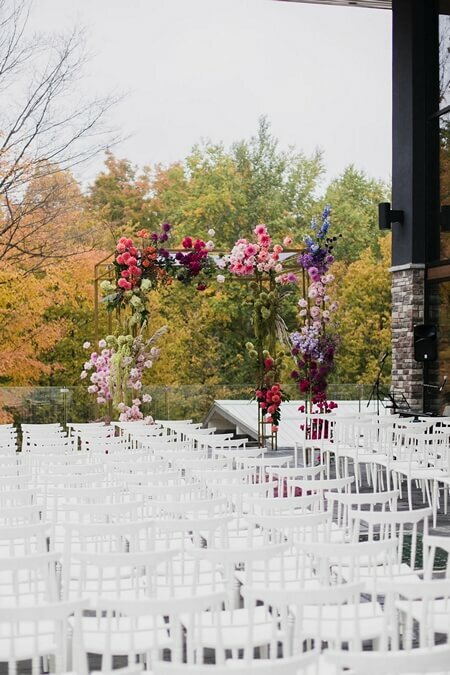 Hayley and Jeff wanted to have a romantic wedding in a peaceful place. 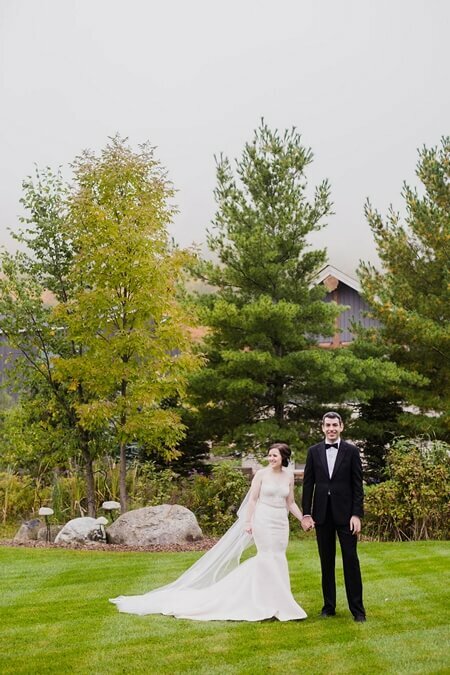 They wanted their guests to relax and not to have to worry about driving back to the city right away. 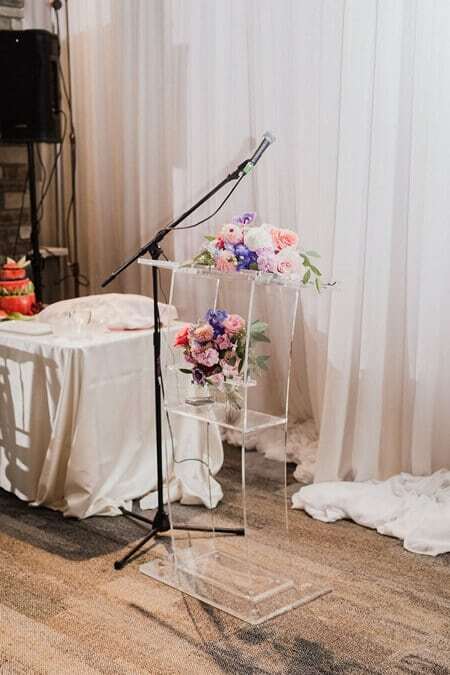 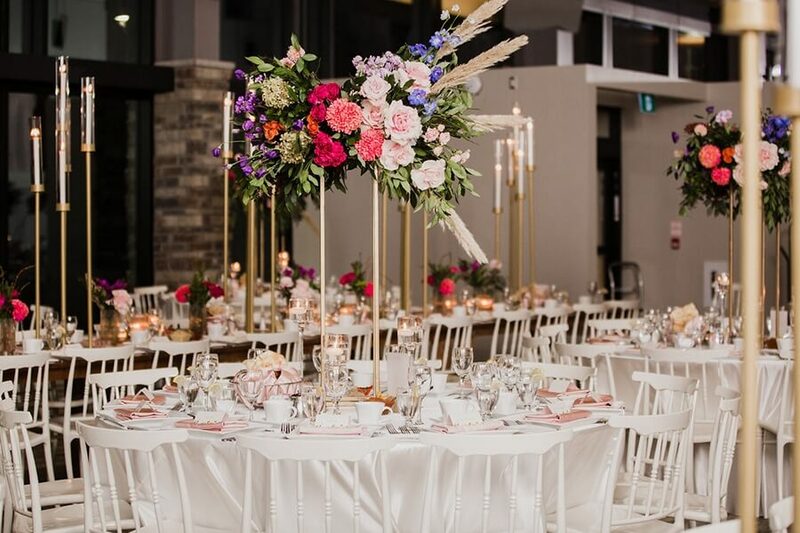 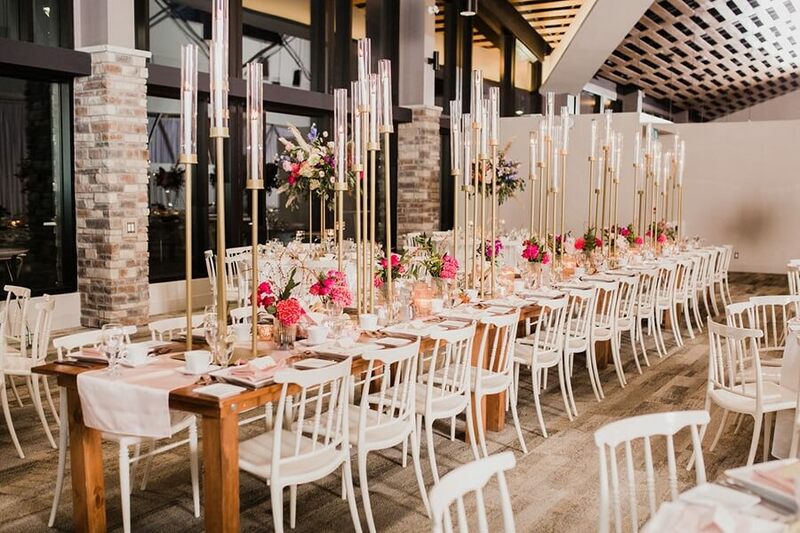 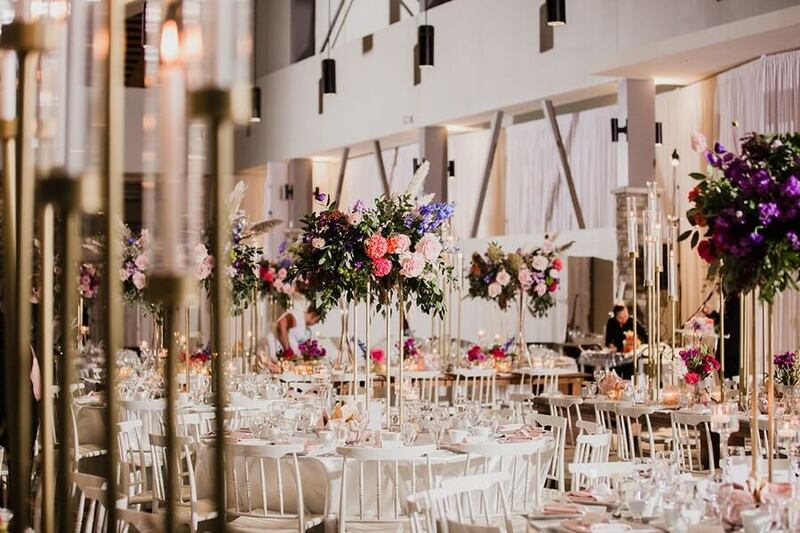 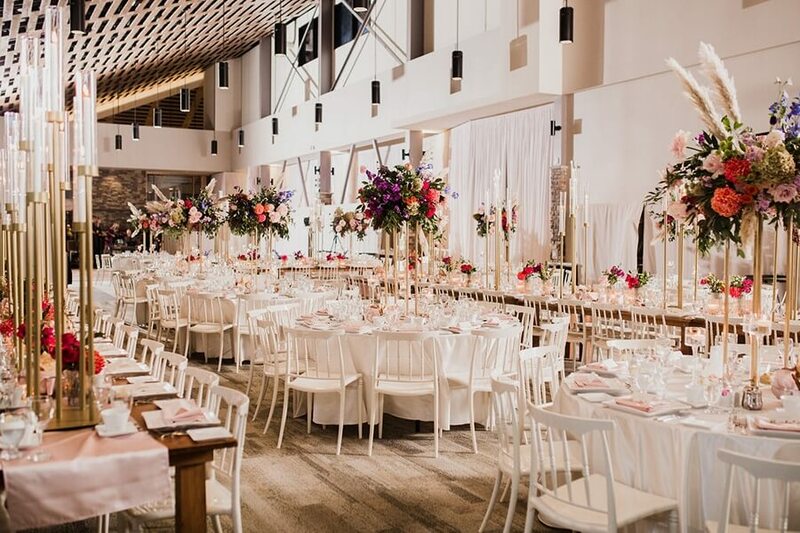 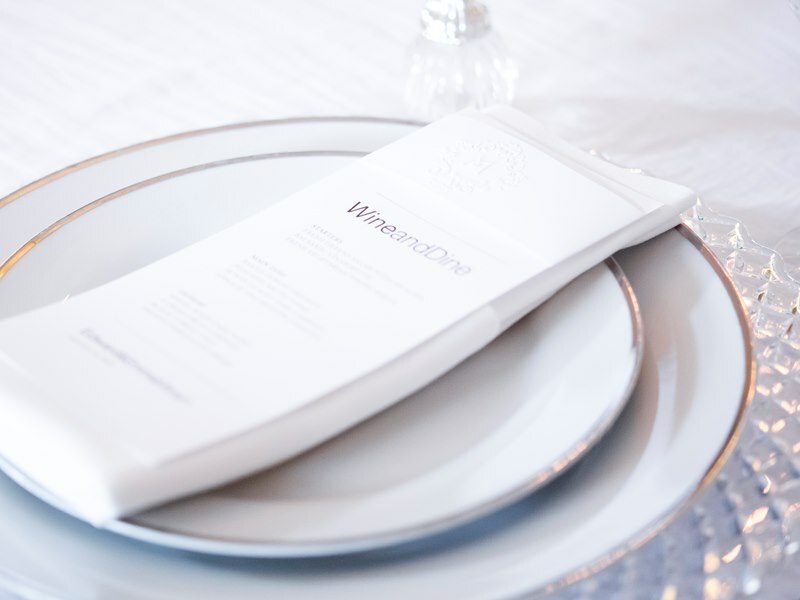 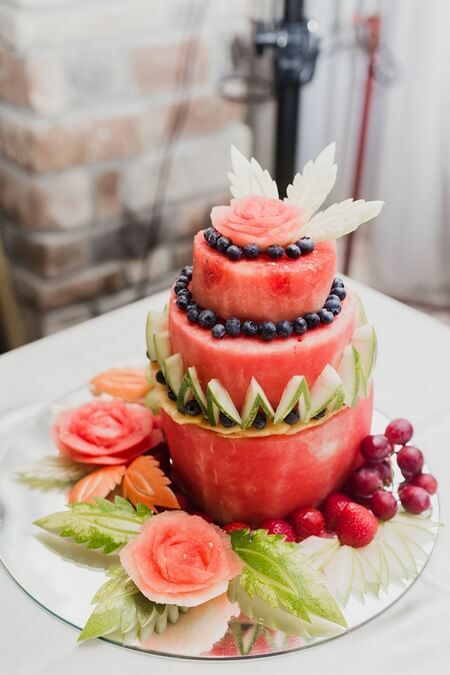 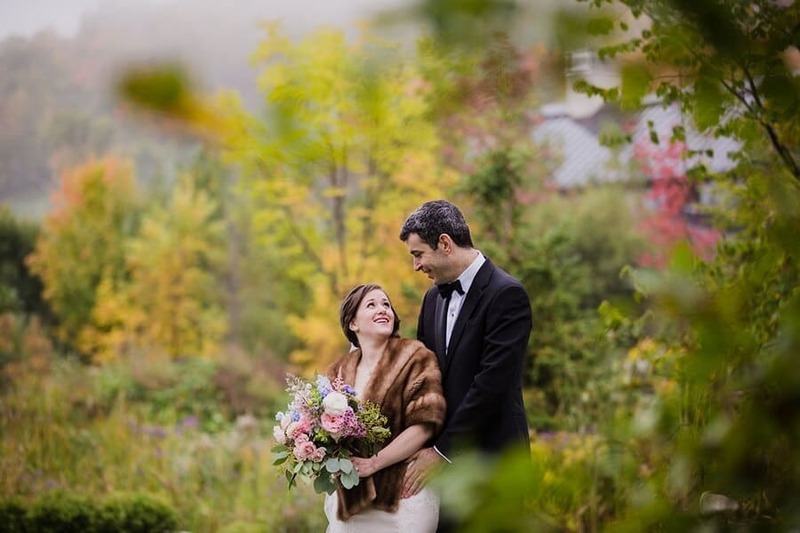 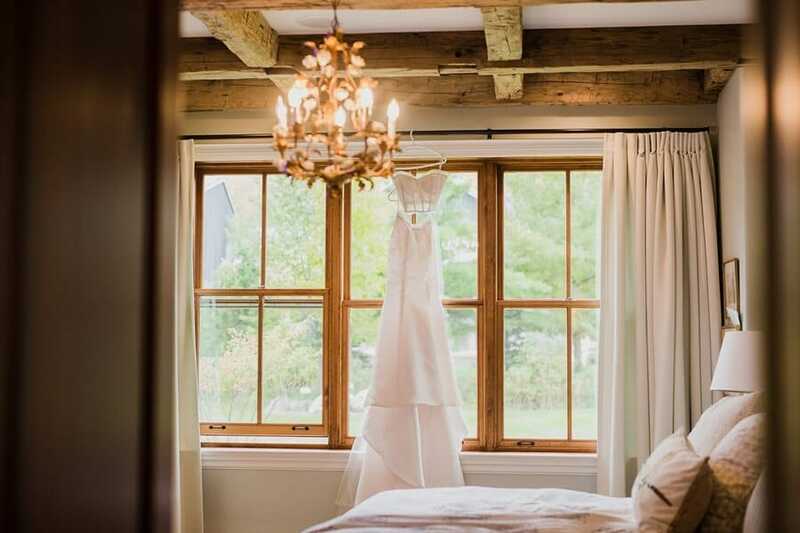 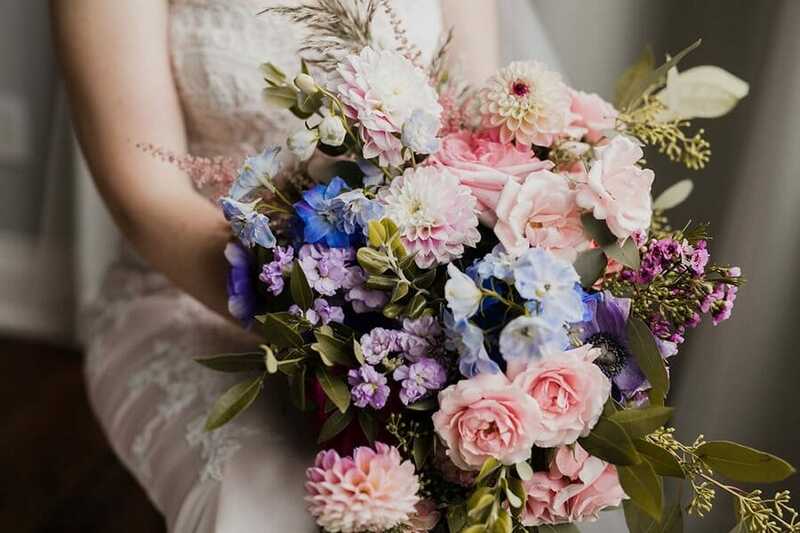 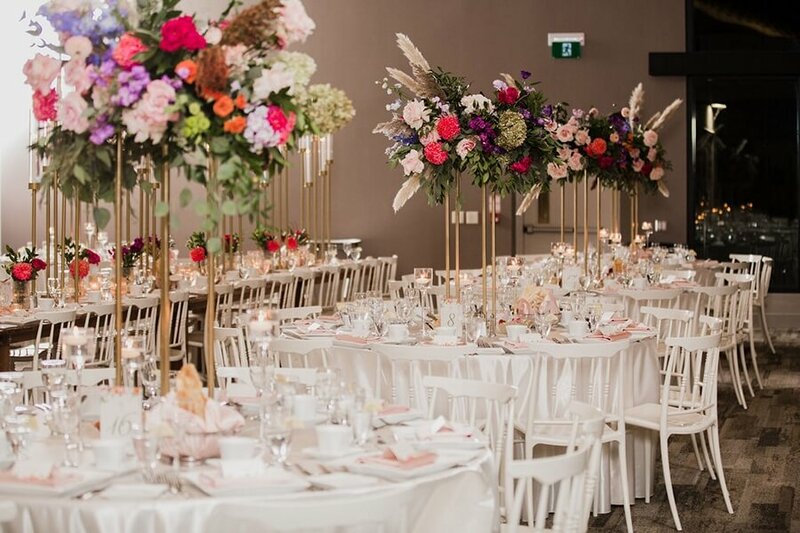 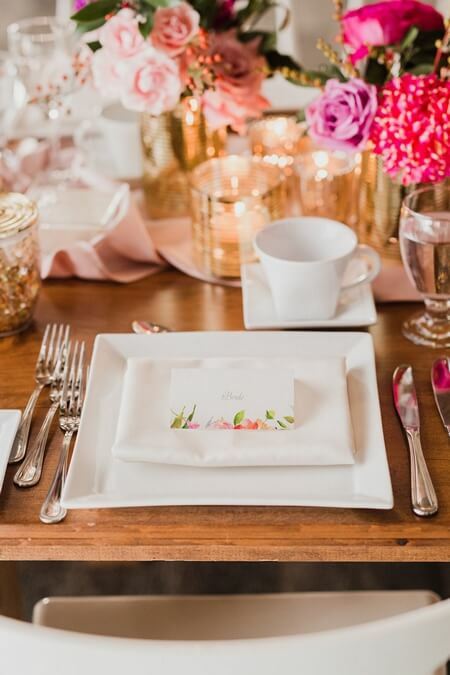 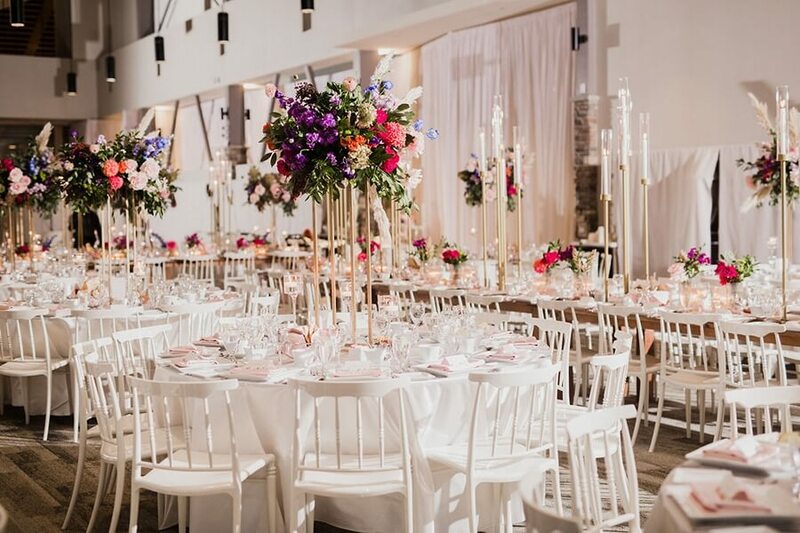 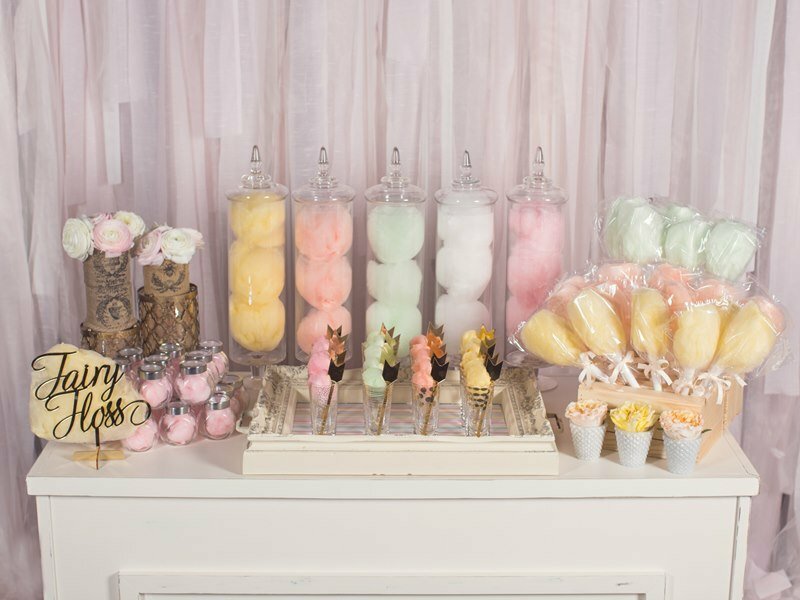 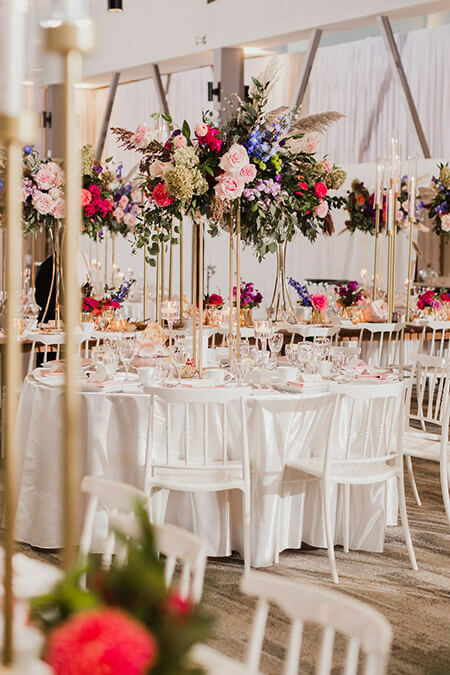 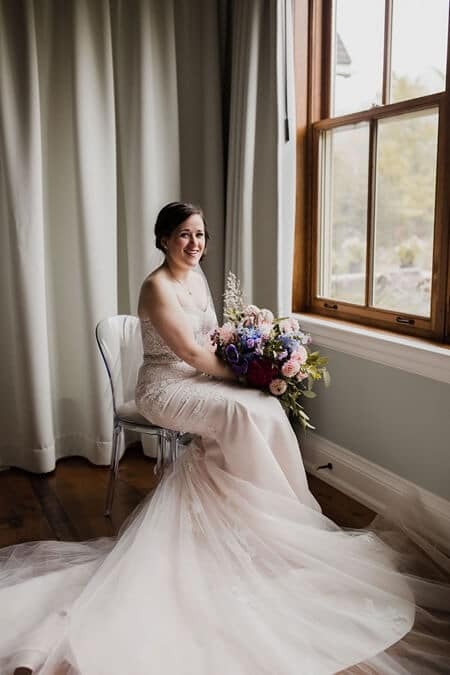 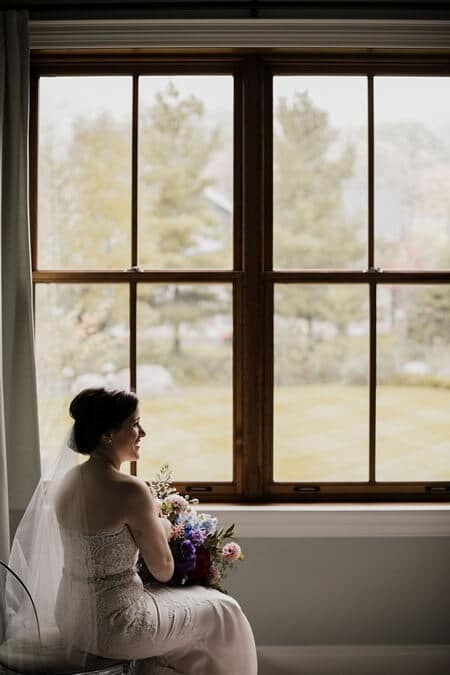 With the help of the team at Fab Fête Event Planning Boutique, their visions became a reality for an ultra romantic wedding at the Alpine Ski Club. 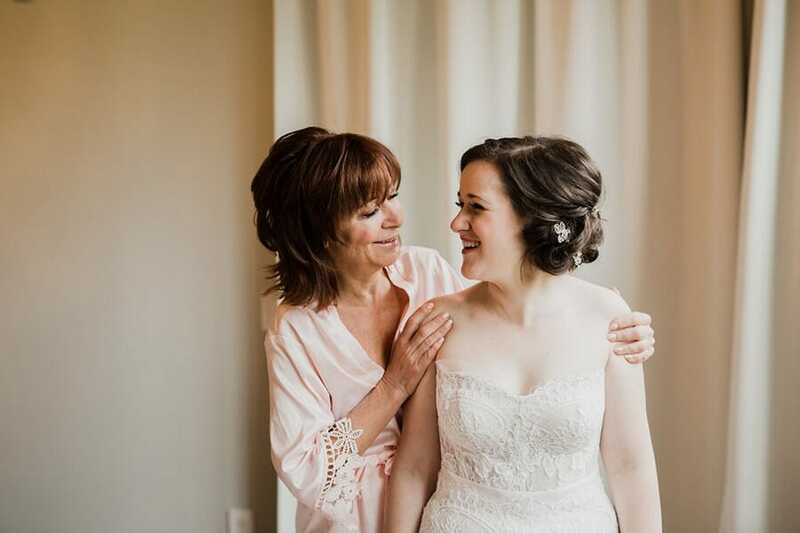 Luminous Weddings documents every special moment. 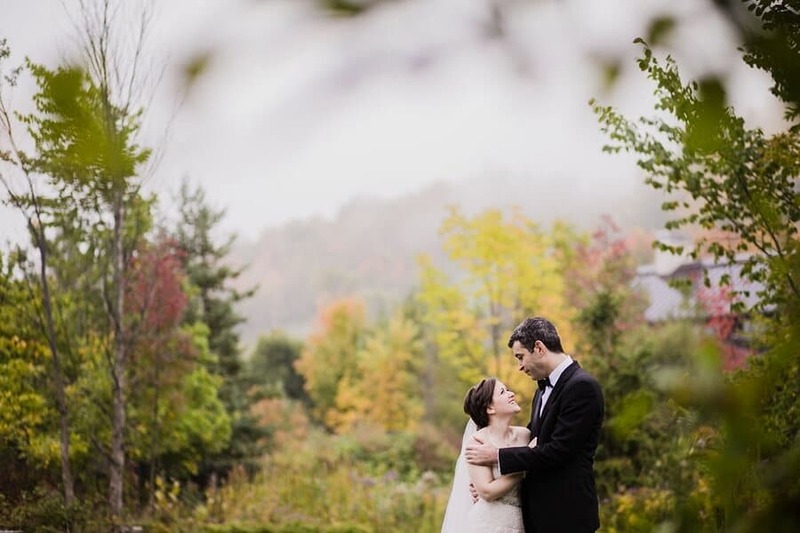 The couple had a fairy-tale photo shoot against a beautiful backdrop courtesy of mother nature. 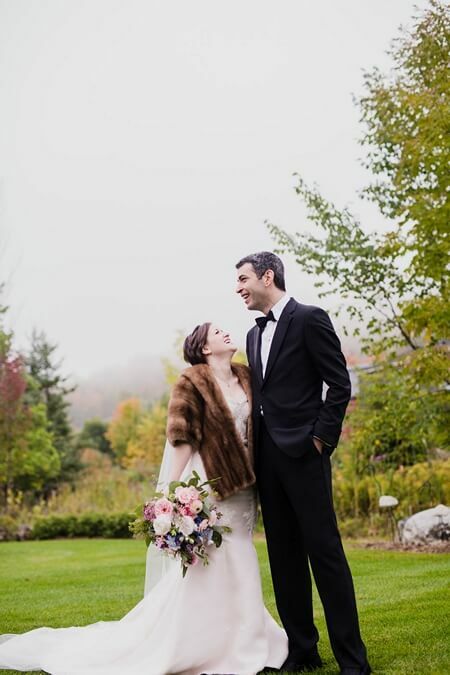 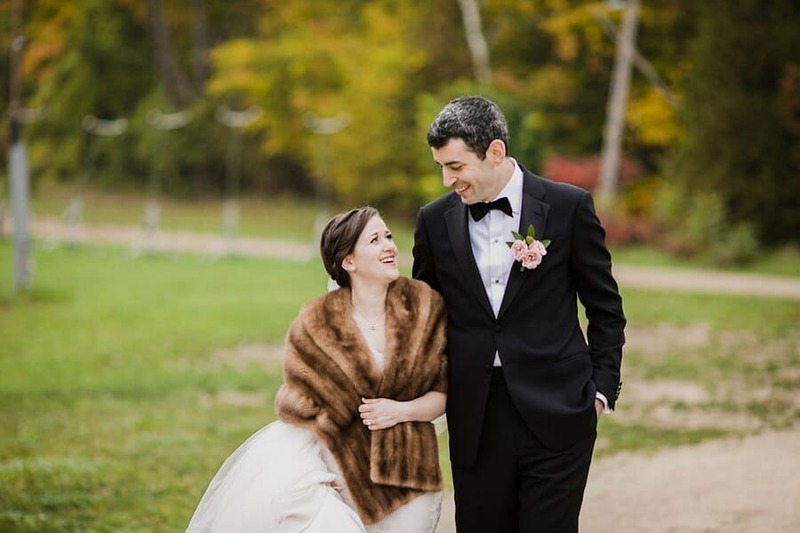 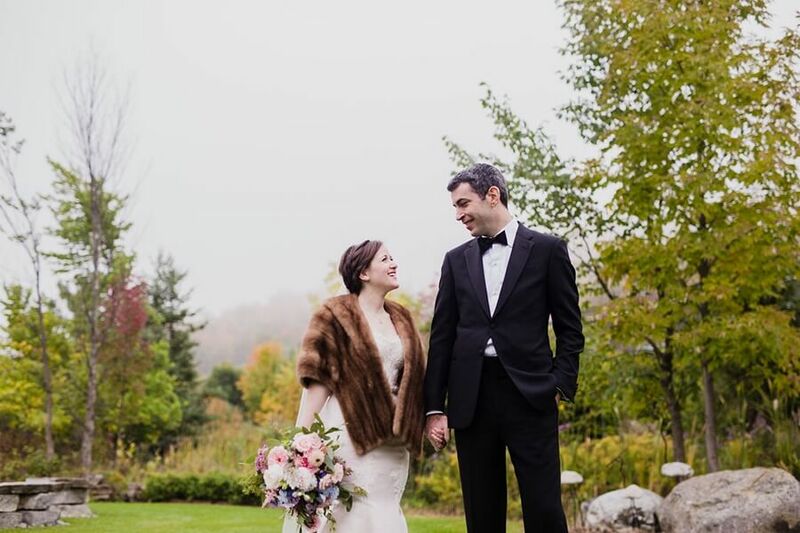 In the crisp cool air, Hayley added a fur shawl to her gown. 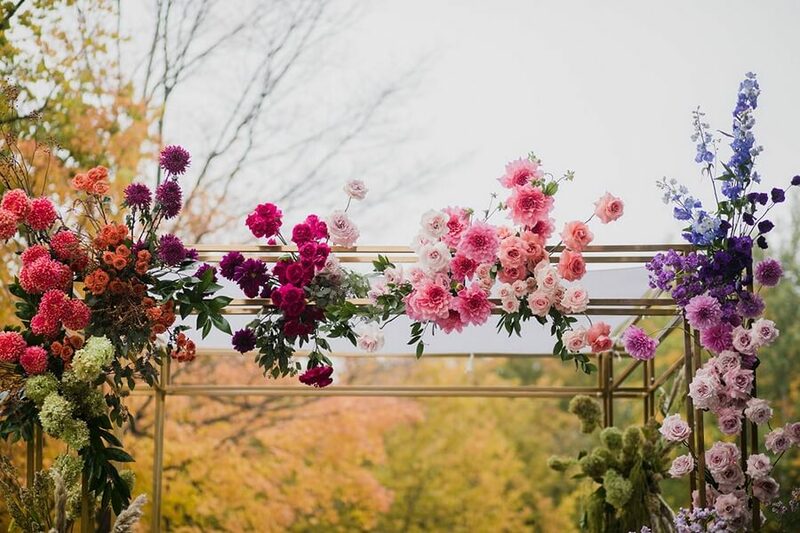 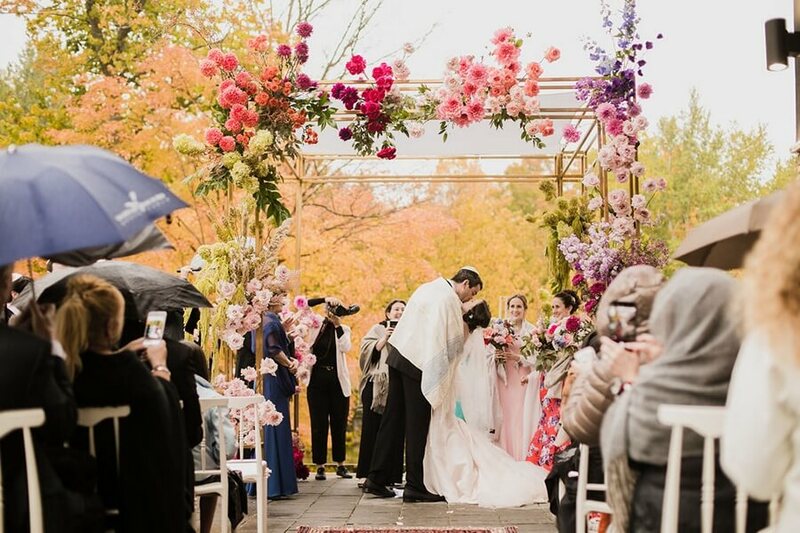 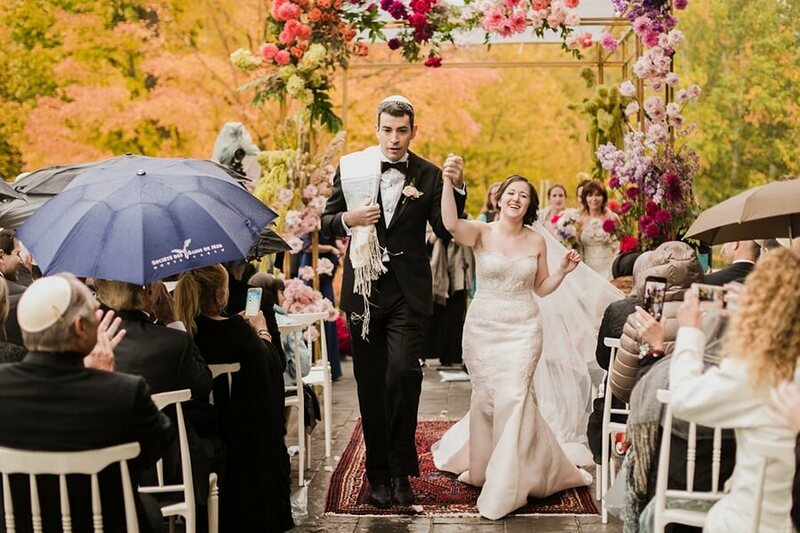 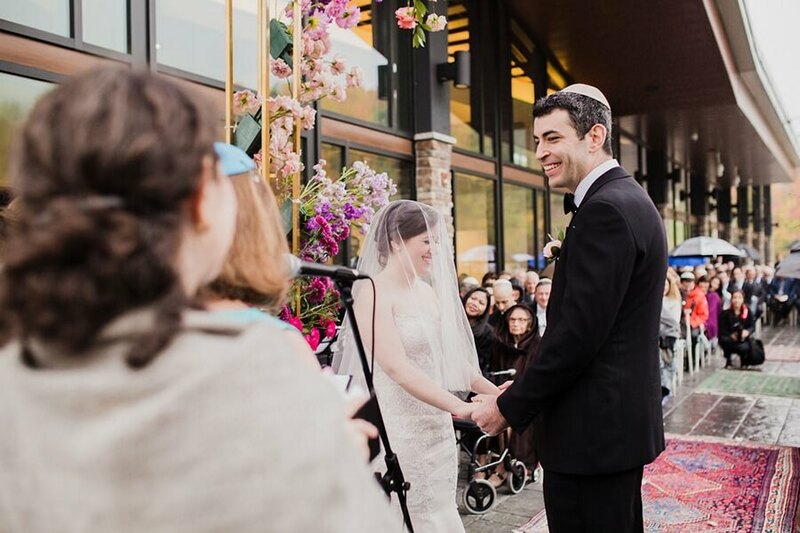 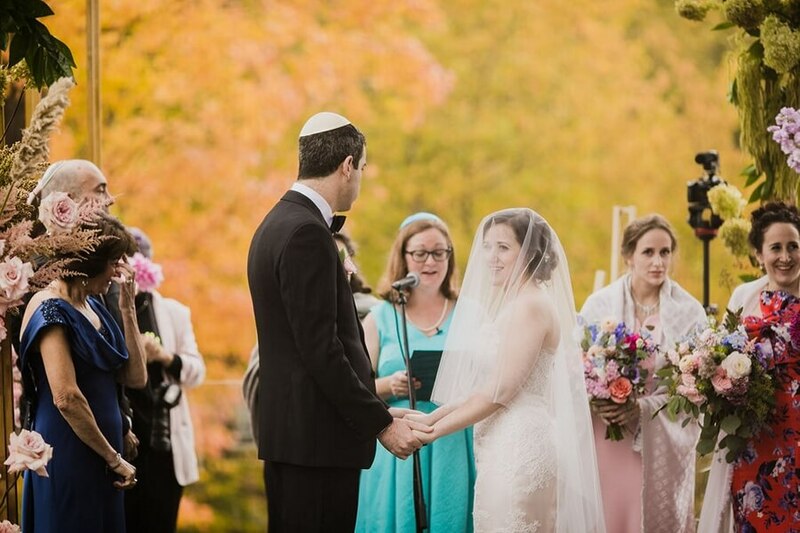 Jeff and Hayley said their I do’s outside under a chuppah beautifully decorated with brightly coloured-flowers. 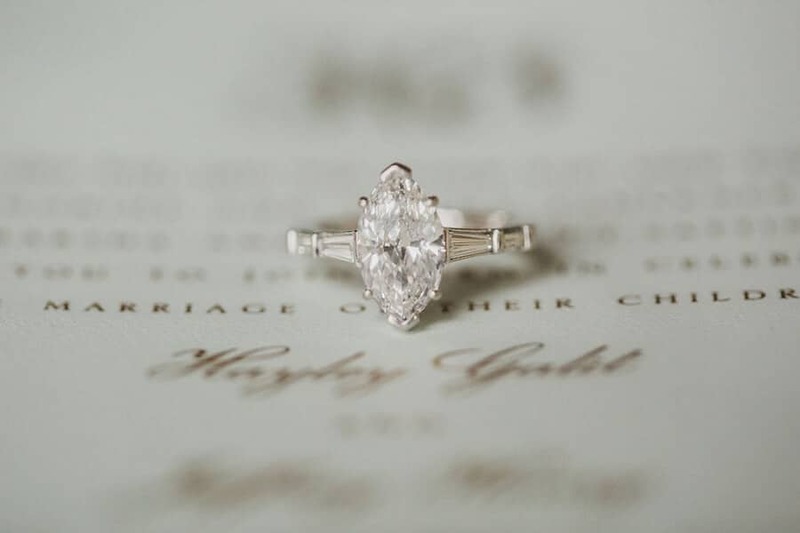 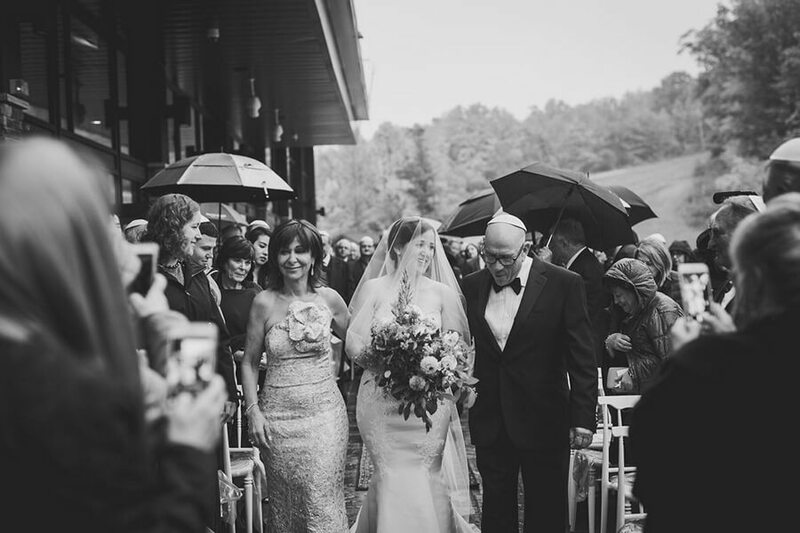 As if on cue, as Hayley walked down the aisle to meet Jeff, a gentle rain began to fall. 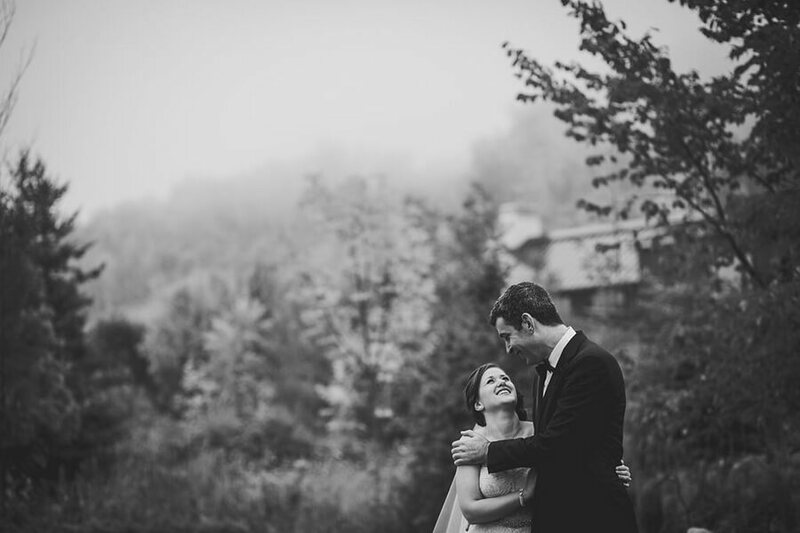 Everyone smiled and embraced the lovely mist. 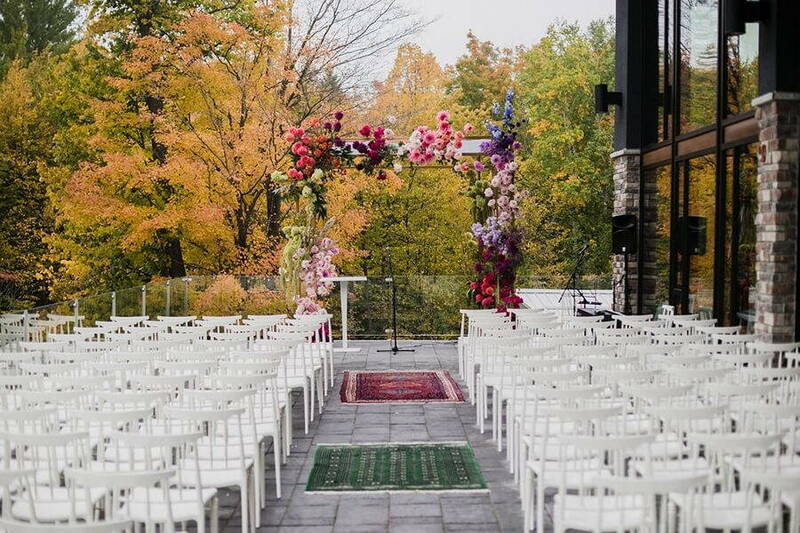 After the ceremony, everyone moved inside the lodge. 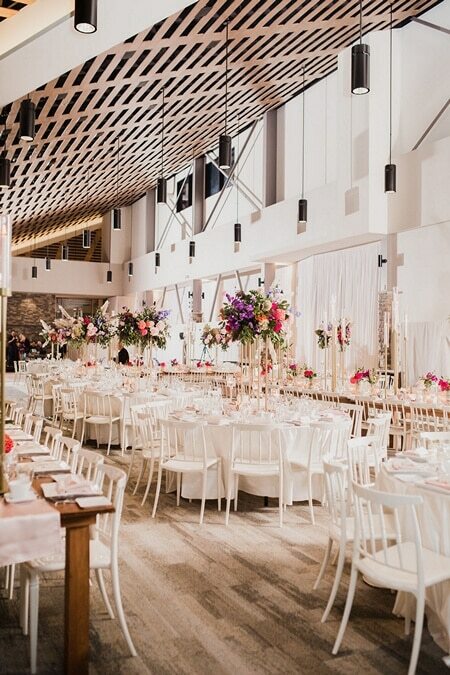 Chic black lamps hanging from a slanted roof and floor to ceiling windows gave the space a modern look, while stone walls provided warmth. 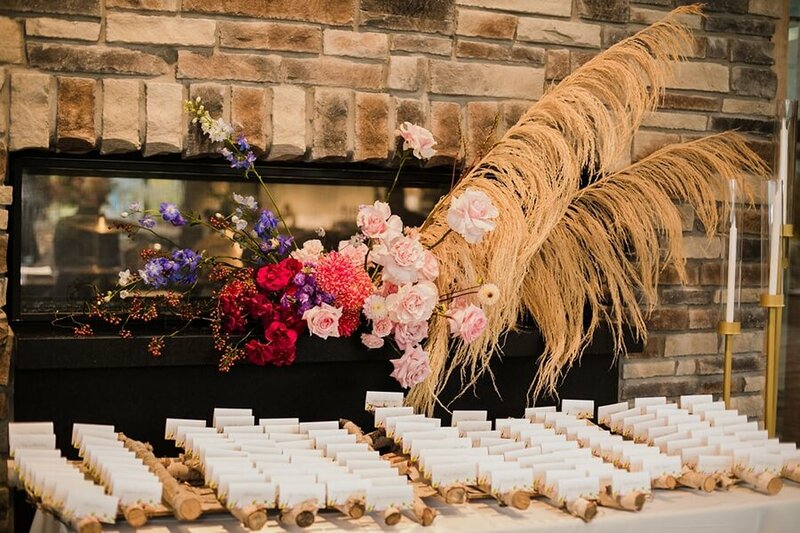 By the entrance guests found their names on logs and took their seats. 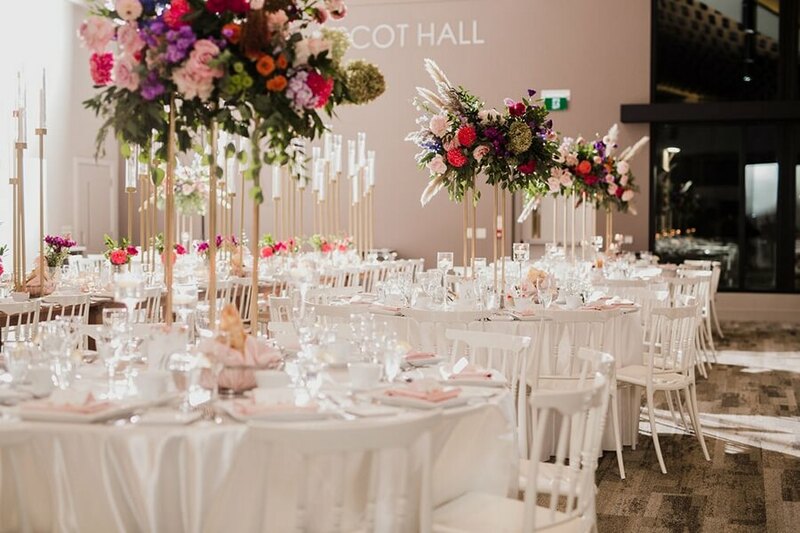 With the help of Chair-man Mills the tables were dressed in white with a touch of soft pink, allowing the vibrant florals to pop. 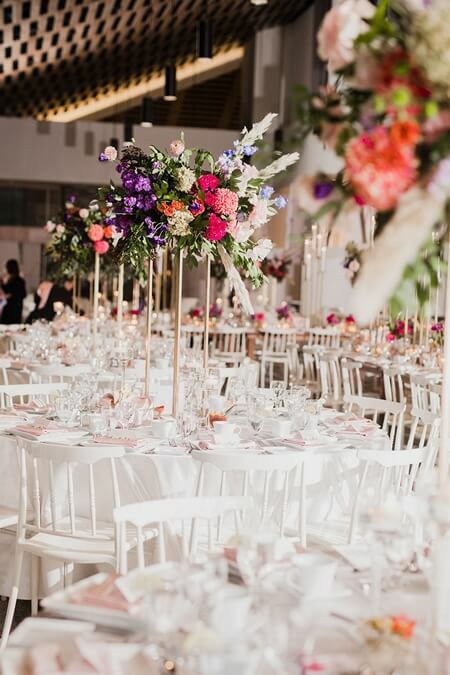 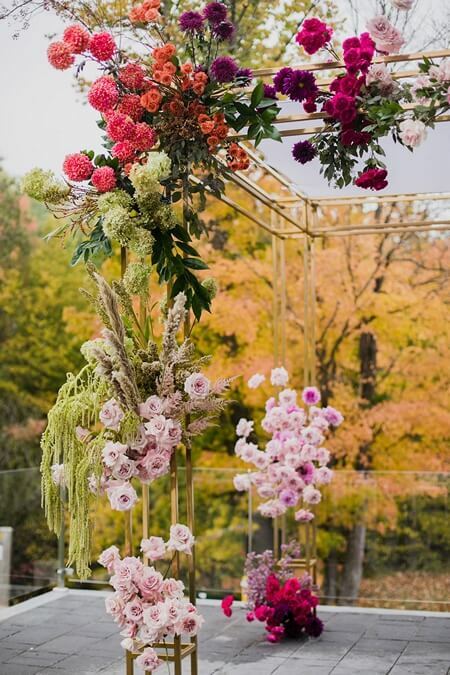 Flowers Time arranged magnificent centerpieces filled with colour and variety. 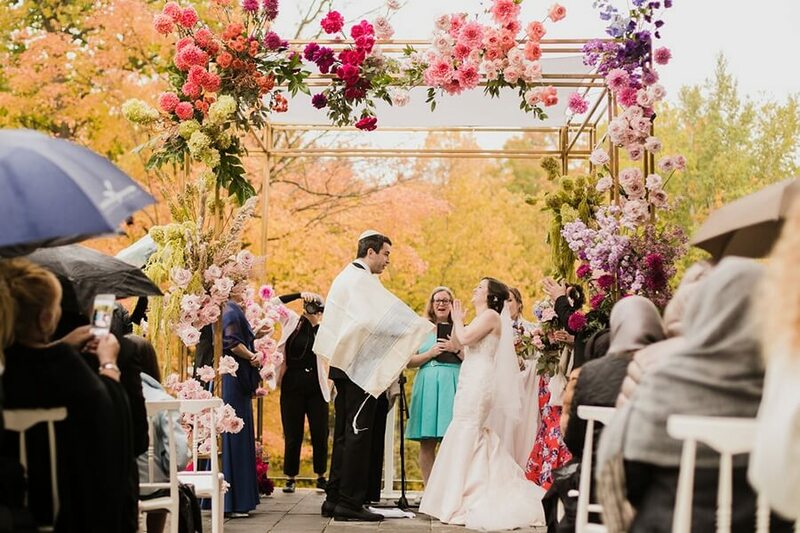 Following a few speeches and a series of toasts, the couple and their guests enjoyed a tasty five-course meal made by Taam Tov Catering. 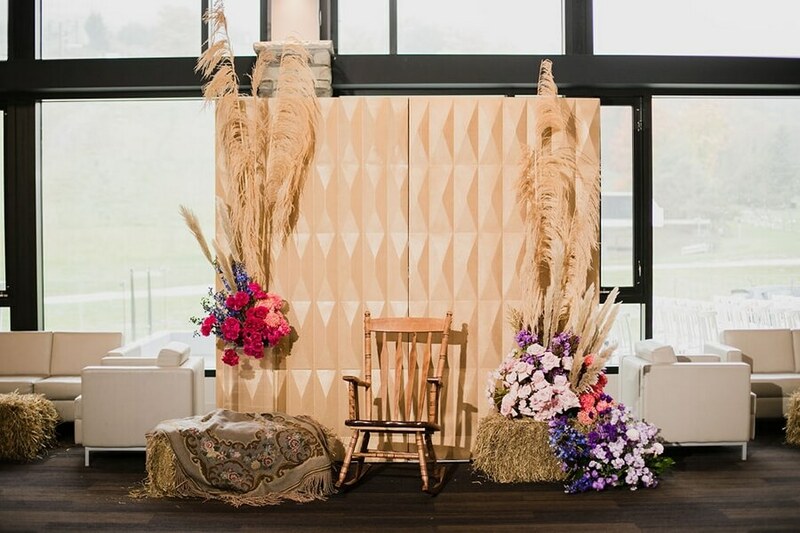 Guests then turned their attention to the harvest tables and the dance floor provided by Happenings Rentals – it was time to get the party started! 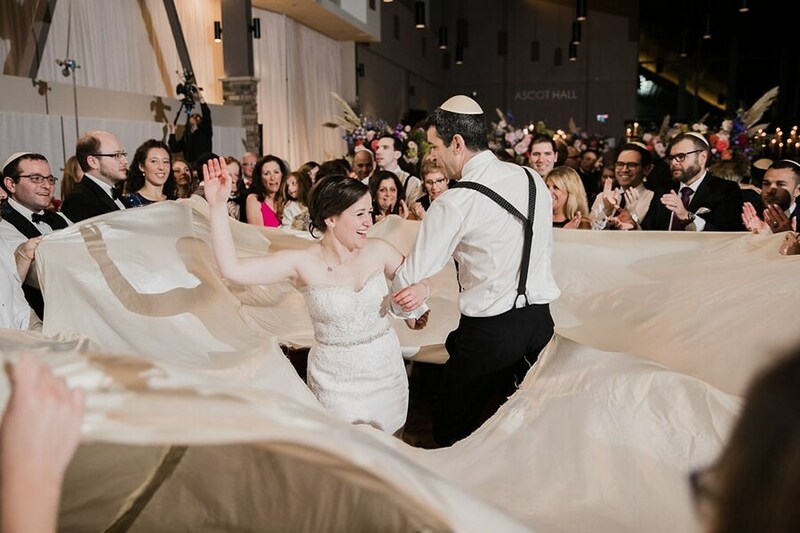 Hayley and Jeff danced and celebrated with their family and friends well into the night!